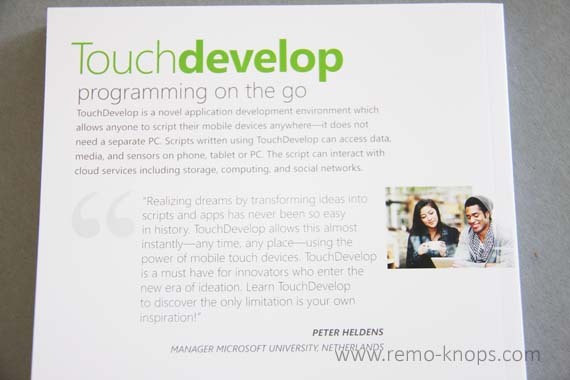 Peter Heldens, Manager Microsoft University Netherlands, has written an article about TouchDevelop a little while ago. Peter is one of the TouchDevelop champions within Microsoft Netherlands, and provided me with the book “TouchDevelop – Programming on the go”. In this article I will have a look at the TouchDevelop book and share my opinion and first impressions. TouchDevelop is a Windows Phone application which gives you the ability to program scripts on your Windows Phone. In addition there is a TouchDevelop web app, that provides a runtime environment as well. You can execute scripts both from the Windows Phone and web app. Compare TouchDevelop with Microsoft Visual Studio 2012 which is the development tool of professional application developers. Personally I don’t have a background in software development, so this start with basics like value types, variables and statements, actions and events is really helpful. The basics are mainly covered in the first 3 chapters from the book. In chapter 4 and further it is explained how you can use different data sources, web services, media types and sensors from your Windows Phone. So you can create simple scripts that show a hello world text on your screen to really advanced games and applications. Scripts that you’ve created can be stored on the TouchDevelop website and shared, so that other TD-users can re-use your script or include it in their project. You can also share your scripts from the website via social media or review scripts from others. In other words there is a cloud infrastructure that enables sharing, reviewing and discussion on scripts. This means that TouchDevelop not only covers the Windows platform, with Windows Phone and Windows 8 (RT). Apple iPad, Apple iPhone, Apple Mac(book) and Google Android devices are support as well, as shown with some examples in the video above. Personally I think it opens a great opportunity to work with this development tool on every major (mobile) platform. You can login to the Web App using your Microsoft, Facebook or Google account. Personally I think that TouchDevelop is a great way to learn scripting and programming in a simple way. 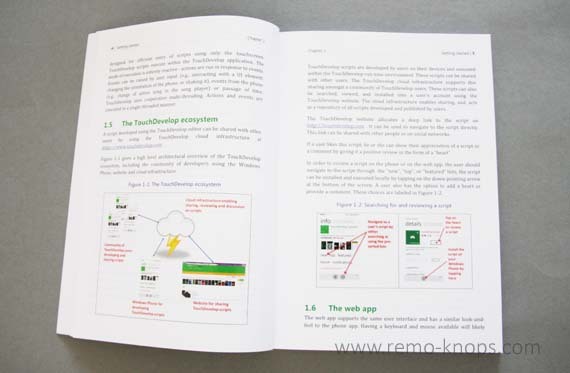 The book “TouchDevelop – Programming on the go” by Microsoft Research is a great resource that will help you gain the maximum knowledge out of TouchDevelop. It is a very complete reference loaded with tables, script samples and the theory is build step-by-step. The only thing you have to do is download a copy the book, install it on your Windows Phone (or alternatively login to the Web app) and start scripting. There are already 25902 scripts published, so get started and upload your scripts. Check out a table with other interesting book reviews on this page. 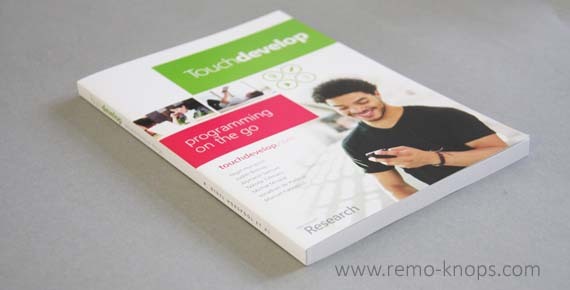 Hey!, I found this information for you: "TouchDevelop – Programming on the go". Here is the website link: https://www.remo-knops.com/4563/touchdevelop-programming-on-the-go/. Thank you.